"The Lord is good to all..."
The way I get a three year old to memorize scripture is repetition. Over and over, we both recite it. The Lord is good to all. The Lord is good to all. The Lord is good to all. Even to me when I don't deserve it. Even to my family. Even to my sweet middle child. Even when it doesn't feel like it. The Lord is good to all. I'm glad I had that truth fresh in my heart and mind. Yesterday, I had an appointment at Vandy again as a follow up for Abel. Infections, hospitalizations, and trouble just weren't on my mind. I was having faith and truly believing he would be released. Finally. After ten months. Instead, after ten months of struggling with this aggressive infection, the surgeon has decided to take his implant out. Obviously, this is nightmare scenario in the cochlear implant community. As he told me the news, doctors gathered in the room with somber faces expecting to console, I suppose. I held it together. Inside my heart, it feels like a devastating blow, though. How silly it is to mourn a foreign object placed into my child's head! It isn't even working. Why should it matter? It's just the point of it all. Another surgery is on the horizon. My child has been put under more times than all of my extended family members put together. More than I can count on two hands. I've gotten to know the back of his precious little head as I strap him into the small umbrella stroller and push him from appointment to appointment. 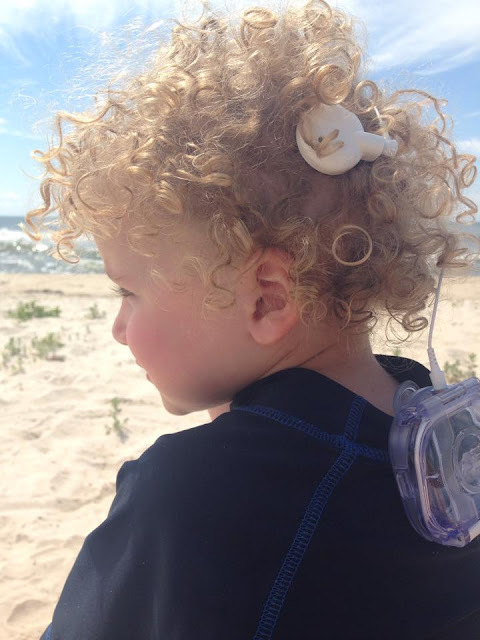 I know his curly tendrils and how they curve around the cords and headpieces he wears daily to help him hear. His head has two "ears" not one. Still, soon he will go under anesthesia again and his right cochlear implant will be removed along with his adenoids and (Lord willing) this nasty infection. A thousand thoughts go through my mind every day. I wish we had never put it in. I'm so glad we had this surgery. I need more chocolate. Et cetera. I never quite considered how I would feel with this news. The answer is sad, but focused on the future. It's a setback, for sure. The surgeon says the infection seems to be nestled in the internal piece of equipment. He is hoping the nerve is not damaged so that once this infection is history, he can re-implant making him bi-lateral again. I don't even want to think about that right now. I appreciate your prayers for him. Despite this ever-present problem, he is doing well. His left "ear" is working great allowing him to pick up much language. Lately, I've noticed him stringing words together into phrases. "What's that? Who is that? I don't know. Brother, no!" You know, the basics ;) Receptively, he's a rockstar. He knows what I'm requesting most of the time. His language is coming and I hope it continues to do so. On top of everything else, his early intervention program stopped paying for his speech therapy. We have begun to appeal to insurance in hopes they will start footing the bill as it is roughly $250 a week. A lot has been going on. For those of you who donated or bought items helping with "Abel to Hear", I thank you from the bottom of my heart. Because of the excess money we raised, I had enough for two aqua ears instead of one. This possibility was on the horizon so I only purchased one aqua capability. The rest of the money I put towards his hospital bills. Please know how much that meant to us. Thank you. It's because of people like you that I can see God's hand in all of this. Thank you for supporting us, for giving, for sharing in our excitement and setbacks, and for praying for my baby. The Lord is good to all. Prayers for Abel and your family! My son lost his only implant to a rare, unusual infection a few short years ago. He was never an ideal candidate for the implants anyway so you know we were prayerful the whole time. What happened after he was cleared a couple of months later was a blessing. They were able to give him two implants instead of just one! A blessing in disguise. Thank you for sharing. My daughter is 7 months post activation and we are walking our own journey due to her other different abilities. The Lord is good indeed, even in the midst of a road that we didn't plan. I cried as I read your story, it is so very similar to ours. Madyson had to have her left implant out 4 months post activation due to a staph infection that could have killed her so close to her brain. She was re-implanted in April and has been doing wonderfully! She understood the process and new that this was something that although it would hurt, it would be extremely beneficial as well. Even after having three previous surgeries one including open heart, kids are so resilient. She tells everyone she knows that she has two implants now! Lean close to God and lean close to family. It gets easier, the appointments will die down and the real progress begins. Mady went from saying jumbled words to 6 and 7 word sentences in the last year and she's almost on the level of a typically developing child her age in speech! Trust your doctor, trust your surgeons and therapists and also everyone else who is helping. I know it seems foggy now and your thrown back into the grieving cycle but a new brighter day is coming and he will accomplish everything he wants in his life!